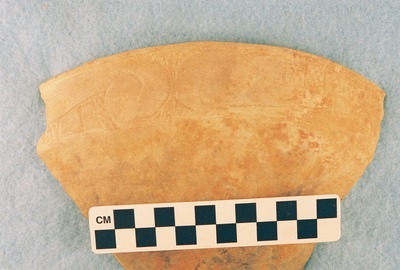 "41CP12, Burial 16, Pot 10b" by Timothy K. Perttula and Robert Z. Selden Jr.
DECORATION: The rim has an engraved scroll motif repeated three times around the vessel. In this case, the scroll motifs are back to back and outlined by cross-hatched areas or dividing brackets between the scrolls. Each scroll has a central scroll line that hooks around the upper and lower scroll fill zones. The fill zones have cross-hatched brackets and columns as well as sets of single vertical engraved lines.